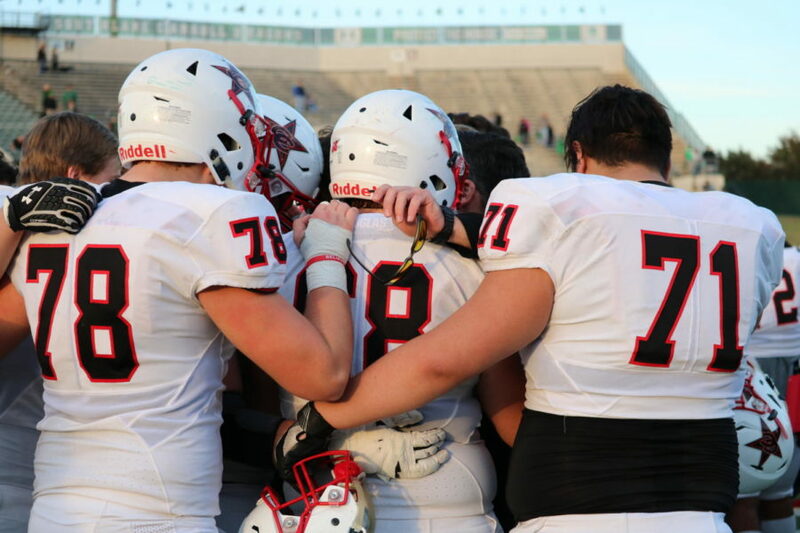 Coppell players share a hug with assistant coach Blake Johnson after the playoff game at Dragon Stadium on Nov. 17. The Carroll Dragons ended the game, 54-10, over Coppell, ending the Cowboys’ season. 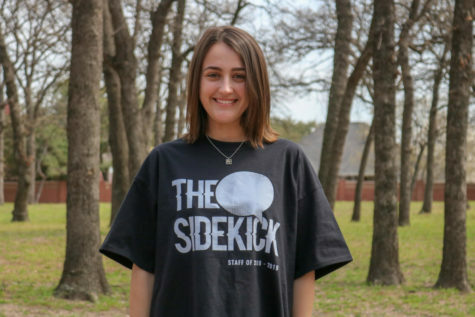 SOUTHLAKE – While the saying “Cowboy fight never dies” still holds true for the Coppell football team – and will continue to – its 2018 season came to an end Saturday with a 54-10 loss to Carroll in the Class 6A Region I bi-district playoffs at Dragon Stadium. Just 12 minutes into the game, the Dragons (11-0) had amassed a 21-0 lead over the Cowboys (7-4). At the half, Coppell still had not found the end zone, but was able to get points on the board with a 42-yard field goal by senior kicker Caden Davis. Going into the third quarter, the score was a dominant 24-3. Late in the game, after the Dragons scored a few more times, the Cowboys found their first touchdown on a 44-yard touchdown pass from senior quarterback Taj Gregory to senior wide receiver Tanner Woodby. With less than five minutes to go, the score was 45-10. 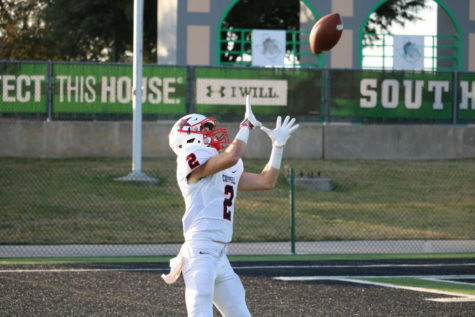 Coppell senior wide receiver Tanner Woodby reaches up to make a catch for a touchdown in the fourth quarter at Dragon Stadium on Nov. 17. The Carroll Dragons ended the game, 54-10, over Coppell, ending the Cowboys’ season. However, for Coppell, a team with 54 seniors, the focus quickly became more than losing a football game. It became about the years of brotherhood they built together. At the beginning of this season, the Cowboys saw it as a sort of rebuilding year, or a “reloading year,” as coach Mike DeWitt put it at the spring scrimmage in May. 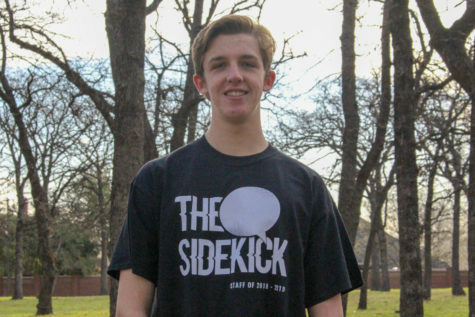 After losing all of the former seniors and a few others who are in this year’s senior class, Coppell had to develop a new starting quarterback and receiving corps. While the first few wins helped boost the confidence of the Cowboys early on in the season, the full development of the team did not start to show until later in the season. After tinkering with different quarterbacks, the Cowboys developed a three-quarterback system heading into the playoffs – one that might have worked had they not played the undefeated Carroll team. Looking back on the year, DeWitt appreciates the role the seniors played on the team. 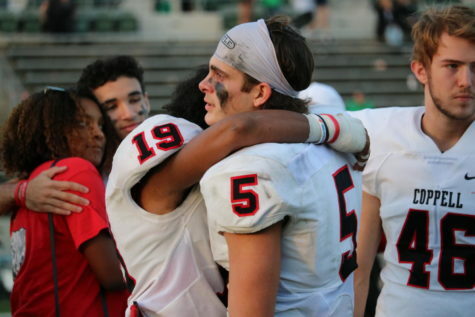 Coppell senior defensive back Justin Murray hugs senior outside linebacker Xavier Brown after the Class 6A Region I bi-district playoffs at Dragon Stadium on Nov. 17. The Carroll Dragons ended the game, 54-10, over Coppell, ending the Cowboys’ season.